Bag Tagz luggage tags are great gifts for any traveler or school child. The personalized, engraved bag tags are sure to please. Priced from $4.99. 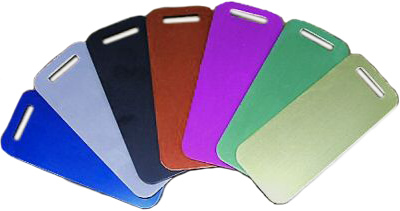 Your luggage will stand out on the carousel with our colored, anodized aluminum luggage tags! These customized metal luggage tags have a smooth surface on both sides for engraving as well as rounded finished edges. The high grade aluminum and anodized finish are extremely durable. The special manufacturing process features rich color on the edges as well as the front and back. Available in several sizes. Personalization ideas. Our solid hardwood tags are recognized worldwide for their laser engraving. Each tag is finished on both sides with two coats of cab acrylic lacquer and cut precisely by laser. Personalization ideas. Full color plastic, one-sided or two-sided with a high gloss finish. UV enhanced to protect against fading in sunlight. Available in a wide variety of shapes and sizes. Personalization ideas. Wasatch Awards & Engraving | Powered by Mantra & WordPress.